Radio Free Charleston has completed our six-episode voyage into Cinéma vérité coverage of FestivAll 2010. I’ve not bid farewell to FestivAll yet, since I still need to finish the detailed production notes for these shows (next week, for sure. I needed a day off yesterday). 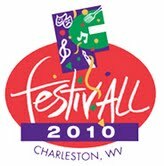 Today we’re going to re-present, in one handy post, all six of our FestivAll 2010 shows. Above you see RFC 102, with The Nanker Phelge, Spurgie Hankins Band, The Kanawha Kordsmen and Bob Thompson. After the jump, you’ll find the remaining five episodes (for a total of over two hours of RFC at FestivAll) with music from Brian Diller, The VooDoo Katz, Comparsa, The Velvet Gypsies, Miss Behavin’, Option 22, Alasha Al-Qudwah, Mark Scarpelli, The Sweet Adelines, Actual Rhinocerous, Bare Bones, T.J. King and many more. You’ll also see lots of the art, parades, theater and film that permeated the city. RFC 103 “FestivAll 2010 Part Two” from Rudy Panucci on Vimeo. RFC 105 “FestivAll 2010 part four” from Rudy Panucci on Vimeo. RFC 106 “FestivAll 2010 part five” from Rudy Panucci on Vimeo. RFC 107 “FestivAll 2010 part six” from Rudy Panucci on Vimeo.